Sorry ...I have been really under the weather for the last several days. I want to use my uptick in wellness to promote the interview exclusive I have with Chris Paget's new company H4RDW4RE.com. States like Washington have everything to lose and nothing to gain from Enhanced Drivers Licenses with WHTI compliant RFID tags - which read and expose coded information from 20-30 feet away. Based on my talks with the EFF, this brand of RFID is the most dangerous. It also happens to be the type DHS wants, even as it has failed their own pilot tests. Get ready to get personal with your travel agent, or from whomever you buy you airline tickets. A change, which is rolling out airline-by-airline but which officially begins to phase in this weekend on Aug. 15, will require that you hand over to the federal government more personal data than ever before in order to reserve a seat on a domestic flight. The overhauled Transportation Security Administration program is required by law, but many consumers haven't heard much about it. "It's still kinda a surprise and they (customers) will say we haven't heard much about this," said Schaumburg travel agent Sharon Peterson. "We have to ask for birthdates and that has been a little delicate for most of us but we have to tell them the reasoning behind it." That reasoning is a new TSA program called "Secure Flight," which transfers the responsibility of pre-screening passengers from the airlines to the TSA. Secure Flight requires that airlines get your birthdate and gender so you can be prescreened agasinst a government watch list. "If consumers do not include this information, they may face delays at the airport, and our goal is to communicate and educate our customers across the board that this day is coming and they are going to have to add this additional information," said Orbitz Vice-President of Governmental Affairs Brian Hoyt. A major goal of the program is to prevent mismatches like that kind that happened to a Burr Ridge teen last year at the Miami International Airport. Omar Jano and his mother Martha said that the TSA's mistaken detention of Omar last year -- because his name resembled one on the watch list -- terrified their family. And Jano is not alone. Mistaken detentions have played out thousands of times; most famously perhaps with Massachusetts Sen. Ted Kennedy. He has been detained six times because his name is close to a suspected terrorist's alias. Not everyone's convinced that Secure Flight will improve the screening process. "It may make life a little harder, but I suspect that the people who are on the no-fly list aren't giving their real names when they fly anyway," said Chicago attorney Geerald Jenkins. Jenkins works with the Cyber Privacy Project, which says that making travelers hand over their birthdates is a step too far toward government control of travel. The right to travel is a constitutionally protected freedom, the Cyber Privacy Project says, which should not be encroached upon by the feds. "The government already has your name and they have the ability to search you. I'm not sure that adding birthdays and gender to that list of intrusions that the federal government already has creates any extra security," Jenkins said. The Secure Flight changes will take place at the time tickets are booked, so if you've already scheduled a trip and weren't asked for the new info, don't worry. The TSA says airlines are phasing in their programs on an airline-by-airline schedule, though though neither TSA nor the airlines would share specific dates. Most major airlines will begin capturing the new data this fall. Secure Flight rules will also demand precise matching information. What is on the boarding pass must match what is on your government-issued ID. That is the customary practice currently but will become law under the Secure Flight program. A TSA spokesperson said there will be plenty of flexibility, however, in the coming months for small discrepancies, so consumers have time to get their documents in sync. The TSA has already spent about $240 million on Secure Flight. The airlines will spend at least $630 million on their programs. An anonymous reader writes"Cable operators at the semi-annual CableLab's Innovation Showcase have informally voted as best new product a gizmo that can determine how many people are watching a TV. Developed by Israeli company PrimeSense, the product lets digital devices see a 3-D view of the world (the images look like something from thermal imaging). In other words, that cable set-top box will know whether three people are sitting on the sofa watching TV and how many are adults vs. children. Do we really need cable and/or video service operators knowing this? It all happens via a chip that resides in a camera that plugs into the set-top box." BTC - Say what you want about Dobbs, I don't love his stuff but at least he will actually report on the SPP. Unfortunately, that makes it a "right wing" issue. Left ended folks can't possibly have an opinion about the SPP and the dissolution of our currency, federal trade affairs and the national defecit, right? Let's not insult each other's intellects. For others this is a sign to procrastinate immigration reform, until 2010. AND last but definintely not least is the UK surveiallance society, which just loves to watch their citizens in a fishbowl. Now everyone can share the celebrity treatment as 1 in 78 citizens are survilled every day. The UK actually outranks Red China for the amount of CCTV cameras to monitor daily living. I think the British government is scared out of its wits. There's no sane reason to distrust a nations people unless you fear THAT much retaliation. 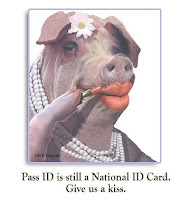 Finally, Campaign for Liberty and the 10th Amendment Center have decided to start singing that old Anti-Real ID song now that the Senate has left for recess. Great work guys. Why don't you guys get out of the politcial theater business and demand a sendover of populist communication when someone other than 22 year old staffers can "field the concerns" about this issue and do something about it? I'm not interested in whatever else is on your political plate. Like Obama, you guys conveniently kicked the can down the road and look the other way when your own state lawmakers call Real ID "immigration". The nation deserves better than to chase the slop you throw out when you "think" the masses can handle it. Don't insult anyone else by declaring this a right-wing issue. 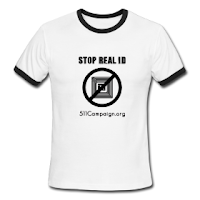 Real ID won't discriminate in political values as to who gets one of the government surveilled identity cards. WAKE UP!! I signed your document, because I hate Real ID, not because you guys are effective. BTC - These two articles came in from the Windsor Star, Vancouver B.C. , a Canadian town due north of Seattle, Washington. Police are confident that the suspect or suspects did not gain any personal information from the ATM in Devonshire mall. The skimming machine was comprised of a camera and an electronic component that’s installed over the card slot which holds a memory card. When police investigated, they found the memory card still intact. Police are unsure at this time if any personal information was compromised at the TD on Walker Road. A man was caught on a surveillance camera at the Walker Road location, but police don’t know how long ago both devices were installed. The WHTI has hurt businesses on both sides of the border and squeezed tourism. Business groups are also worried that when the recession ends, and truck traffic ramps up again, the border will turn into a chokepoint for two-way trade. In the hours after 9-11, we used this space to point out that the immediate priority of our American neighbours would be to improve national security, and they would start with their borders. We argued that the U.S. would build a higher, stronger wall around itself to protect its citizens, and Canadians could not afford to find themselves on the wrong side of the new security fence. If that happened, the price to pay would be the erosion of a co-operative relationship that had created the world's most open and intertwined economies. Now, eight years later, we haven't reached the point that the Canada-U.S. border has become a wall, but it is not the same border it was before 9-11, and it isn't operating in the best interest of either country. The days when you could count on hassle-free travel across the border are mostly over. The last-minute decisions to cross the border for dinner or a night-on-the-town aren't being made as often. Initially, it was the risk of delays as U.S. customs ramped up inspections. Now traffic in both directions is down again with the U.S. requiring passports or similar documentation (the Western Hemisphere Travel Initiative) to enter the U.S. The rule applies to both Americans and Canadians. Bad ideas have a habit of hanging around our nation’s Capitol, where legislators and bureaucrats hope that they will ripen with the passage of time. Thus it has been with the REAL ID Act, passed by the Congress in 2005 with virtually no debate. From the start, the legislation posed major problems for the states, forced to implement its costly mandates; and for privacy experts, concerned with its many privacy invasive provisions. The Bush administration strongly favored the REAL ID program, but it never could get its act together sufficient to drive home the law’s implementation. Even when the prior administration issued final implementing regulations in early 2008, the net effect was to throw gasoline on the anti-REAL ID forces already smoldering in dozens of state legislatures and governors’ mansions. The total cost of the program, including for the states to completely revamp their drivers’ license systems, was estimated to run upwards of $23 billion. This fact alone caused several states formally to balk at moving forward in compliance with the law. (Georgia passed legislation in 2007 permitting the governor to delay implementation of the law until proper safeguards could be put in place). Officials in other states eager to take advantage of the massive information database that would be created by this de facto national identification card system, claimed that states failing to come on board were harming the fight against terrorism. Proponents of the REAL ID rarely fail to remind their audiences that several of the 911 hijackers possessed state-issued drivers licenses procured through false information (as if having Uncle Sam enforce a single, national standard for drivers’ licenses would magically prevent such problems from ever recurring). The problem is, when Congress gets it wrong the first time; it rarely gets it right the second time. PASS ID, while smoothing some of the rough edges of its REAL ID cousin, and promising to lower the cost to the states, suffers from the same privacy invasive problems. It is also, in every sense of the word, a national identification card. Both, for example, would require cards for access to federal buildings and to obtain federal services; both systems would be based on a massive database of citizen information; and both would include imbedded biometric information (and possibly a radio-frequency identification chip). Not content with relying on PASS ID to secure sufficient support where its predecessor failed, some in the Congress — most notably Sens. Chuck Schumer (D-N.Y.) and John Cornyn (R-Tex.) — are using fear of illegal immigration as another vehicle by which to mandate a national, biometric-identification card that would be required before any person could secure employment. Clearly, those relishing the creation of some form of national identification card and the national database on which it would rest, will themselves not rest until they have realized their dream. Those of us opposed to such a travesty, likewise must not let up.